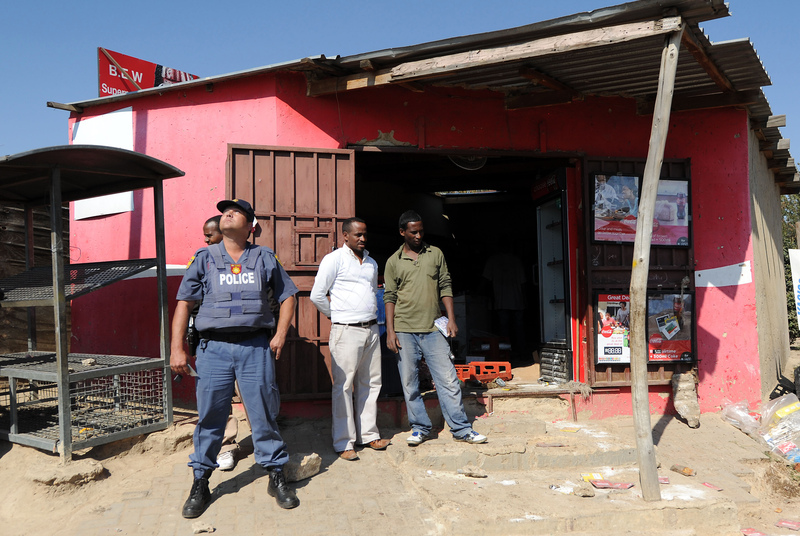 In the latest of a series of intolerant attacks across South Africa, foreign-owned businesses were ransacked in east Johannesburg overnight. The violence, which according to BBC forced 200 foreign nationals to seek shelter in a police station, is the most recent flare-up of South Africa’s pervasive xenophobia. The “rainbow nation,” prevented previously from tearing itself apart, is once again riven with internal tensions: this time between South Africans fearful of losing jobs and the immigrants who they believe are taking them. Twelve people have been arrested in the aftermath of the attacks, BBC reports, while five people have been killed in similar xenophobic actions in the last few weeks. According to Reuters, foreigners in troubled areas have begun arming themselves, fearful that the police would not protect them. One such vigilante group, armed with machetes, has been roaming east Johannesburg — prompting a crowd of anti-immigration protestors to challenge them. Reuters reports that police used rubber bullets and a stun grenade to disperse both groups Friday morning. A report by research group Consultancy Africa points out that while unemployment in South Africa is around 24 percent, the country has the highest number of immigrants in the Southern African Development Community (SADC). A relatively stable country, and generally considered one of Africa’s economic powerhouses, the country draws migrants from across the region. Many jobless South Africans believe the influx of immigrants lowers their own chances of making it in the country — despite the fact that this simplistic theory has been debunked. We have to, each and every South African who's a peace-loving South African, to stand up and condemn this… Today we can't... say that we want to live in isolation when the whole world is globalizing. The most recent uptick in xenophobic attacks began two weeks ago in the port town of Durban, when foreign-owned shops were attacked and a rowdy crowd chanted anti-immigrant messages. Foreign shop owners, terrified of being targeted, closed their shops in the aftermath — effectively shuttering their livelihoods. Meanwhile several African states, including Kenya and Malawi, have made moves to evacuate their nationals from the country. President Jacob Zuma condemned the violence Thursday, calling the xenophobic attacks “shocking.” Zulu King Goodwill Zwelithini has been accused of stoking the violence by commenting that foreigners in South Africa should “go back to their countries.” AlthoughZwelithini says that his comments have been taken out of context, the South African Human Rights Commission is currently investigating accusations of hate speech made against the monarch. A massive rally against the xenophobia swept through Durban Thursday, as 5,000 people took to the streets to demonstrate their disgust at the attacks. Their message? “Down with xenophobia” and “A United Africa.” The city mayor led the chanting masses through the city. “It's just a mammoth show of support for all those foreigners who have fallen victim to the past two weeks of xenophobic violence,” one protestor told BBC. Regarding the attacks, the Desmond and Leah Tutu foundation released a statement this week that announced, “The fabric of the nation is splitting at the seams; its precious nucleus — our moral core — is being ruptured.” David Smith writes in The Guardian, “South Africa is to many Africans what America represents to many around the world: an escape, a fresh start, a land of opportunity.” But many immigrants, hopeful of what South Africa can offer them as they flee from economic uncertainty and political instability, end up with their dreams of a free and fair nation crushed. What you don’t see is you don’t see Australians being chased on the streets, Britons being chased on the streets and similar demands being placed on them that they should be leave the country and so on… What you effectively see is largely Africans against one another in a sense now... In a sense, what we are witnessing are actually Afrophobic kind of activities and attacks, resembling all elements of self-hate among Africans. What is so shaming is it alienates us from our neighbours and calls into question the integrity of our entire constitution. It exposes the systemic violation of injustice: today it is foreign nationals and tomorrow it will be Indians and after that it will be whites. There is anger and hatred growing among us. South Africa’s political opposition parties have criticized Zuma for not doing enough to condemn the violence. Mmusi Maimane, parliamentary leader of the Democratic Alliance, has said that the latest violence is driven by socio-economic issues that Zuma’s ANC party has not done enough to ameliorate. “The root of this problem lies in our inability to bring about economic growth and decrease the inequality that plagues our nation,” she said. South Africa is one of the most unequal nations in the world, and inequality in the country now is greater than it was at the fall of Apartheid. Whatever the reasons, South Africa must act quickly to diminish these tensions. The police (who don’t always have the greatest relationship with residents of underprivileged neighborhoods) are doing their bit to attempt to curb the violence, having apparently established a 24-hour joint operation to clamp down on the attacks. The country’s history indicates that if the violence isn’t taken seriously, it could end up with a sizable death toll. In a 2008 wave of anti-immigration violence, at least 62 people died.